In this message on leadership Glenn address some of the issues ignored in the pop church growth books. 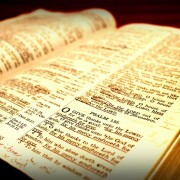 The Bible is the Christian’s handbook on what leadership means, not the secular business world. A good leader first and foremost must be a person of godly character. A leader that does not have godly character destroys lives. We can only give what we are and what we possess. A spiritual man will give from the wealth he has received from God, a carnal man can only give out of the flesh. This sermon will present the power that a Pentecostal leader should really possess. In this teaching by Glenn Meldrum you will learn some of the basic truths about authentic revival. With a very practical approach that comes out of sound Biblical study and personal experience you will learn valuable truths that you can apply to your life. Your heart will be stirred in this teaching by Glenn Meldrum. You will learn the importance of godly character, what it is and how to mature in Christ. Proof of spiritual maturity is always revealed in the quality of our character, not in our gifts, talents or years we claim to have been a Christian. Be challenged to be more like Jesus. Glenn Meldrum preaches a powerful message on being desperate for change. There is no hope of change for those who do not want to change. Many who claim they want to change are not desperate to take the path marked out in Scripture that always leads to victory. When people who call themselves Christian live defeated lives it is because they do not want to live out the truths of God’s Word. Learn the practical means to be an overcomer through Jesus. Preached at an urban church, Glenn confronted the spiritual barrenness of the people and called them to repent and renew their relationship with Jesus. Mark 14:1-11 is the text from which Glenn preaches. This message is about Mary who anointed Jesus’ feet and the costliness of true faith. Our anemic version of American Christianity that is a plague upon the church knows little to nothing of extravagant love—the love that brings joy to Jesus. Listen to this message if you want to learn how to love Jesus more; avoid if you don’t. Glenn Meldrum, preaching more as a pastor rather than an evangelist, presents the wonder that God is the only free Being that there is. We, as creatures, are totally dependent upon Him whether we like it or not and whether we acknowledge it or not. Learn what this divine attribute means to the human race and specifically to believers.